I wouldn't normally quote straight from a press release, but the one I got about Super Mutant Alien Assault describes it as "the Citizen Kane of Super Crate Box" clones, which just about sums it up. 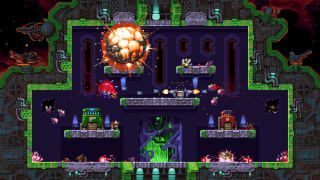 Developed by Melbourne studio Cybernate, Super Mutant Alien Assault features randomly generated levels as well as "countless weapons, explosives, sidearms, abilities and moves." If you're not sure what Super Crate Box is or what a "clone" would entail, all you need to know is that SMAA is a single-screen 2D platformer where you've got to kill stuff. The trailer above should give you some feel for it, but it's a twitch-based affair. The game supports both singleplayer and two-player local coop. The game hits Early Access on August 20, but it's already 90% complete. The EA period is all about the usual refinements and player feedback, though more levels and items will be added during the campaign.